The BJP’s swanky headquarters on Deen Dayal Upadhyaya Marg were being spruced up for celebrations after the trends showed early leads for the party but the mood changed abruptly by the evening with the halt in its victory march. The workers had begun to gather right from the morning when the trends started pouring in signalling an emphatic win for the party. BJP president Amit Shah was reported to join the celebrations but as counting of votes registered a slowing down, the celebrations were put on hold. By the time Prime Minister Narendra Modi reached the office in the evening to chair the BJP parliamentary party meeting, the news of a bridge collapse in Varanasi made the evening more sombre. Modi, who is MP from Varanasi, congratulated the party workers for emerging as the single largest party in Karnataka but also mentioned the tragedy in Varanasi leading to several deaths. Despite not getting a simple majority to form the government, Modi described Karnataka victory as extraordinary. The BJP was looking for a toehold in the southern part of the country and the Prime Minister said that the victory in Karnataka proved the pan India credentials of the BJP. “A misconception has been created by some that the BJP is a north Indian party, it’s a party of Hindi speaking states,” he said. BJP president Amit Shah also told the party workers that the Congress tried every dirty trick to win the elections but failed as the people rejected the divide and rule policies. He said dynastic politics of the Congress has been rejected by the people. Meanwhile, Amit Shah’s three emissaries – union ministers Prakash Javadekar, JP Nadda and Dharmendra Pradhan – were rushed to Karnataka to cobble together the numbers to form the government. 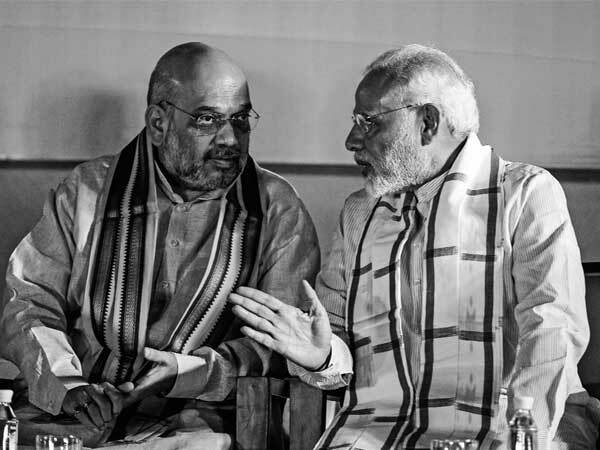 Learning from the Bihar elections in November 2015, where the BJP workers had prematurely gone into celebrations only to learn that the party had actually lost the elections, the party waited for the leads to establish in victories. But the twist was reserved for the fag end when the BJP’s numbers halted at 104, eight short of the majority mark.